As an undergraduate I gradually erased the mental image of a bold line separating environmental concerns from development-economic issues. Environment does not equal only panda bears. Development does not equal just economic growth. Those working in corresponding fields intend to arrive at the same, logical destination whether they know it or not: sustainable, mutually beneficial relationships between humans and their source of livelihoods and sustenance, also known as the nature. Our economy runs on natural resources, transforms them into products and even services through the energy going into people and machines the machines they operate. There are a few major distinctions between development and environmental issues, but their overlap is much greater. Even professionals in both areas, however, do not always see the relationship between their fields, not to mention the general public’s perspective. That is one of the reasons I am at Conservation International for the summer. 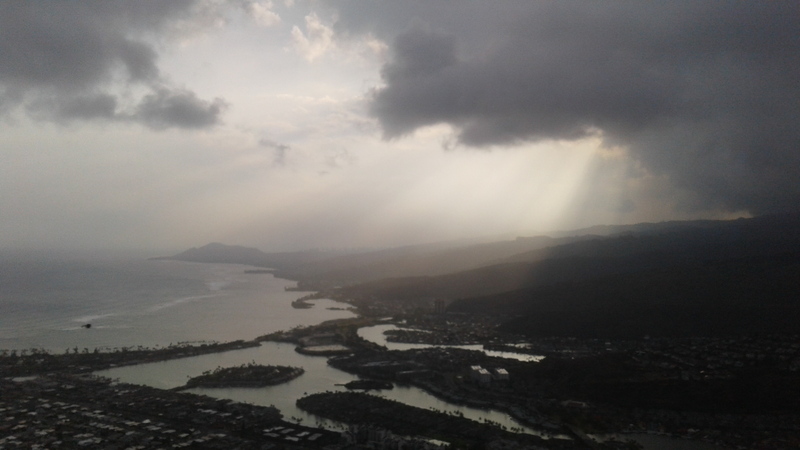 Yes, here in Hawaii, gazing over beautiful coastal curves and green hills with sun beams cutting through the gray clouds which have just formed due to the rugged topography of Oahu. The marina (above) looks like a work of modernity, yet another feat of our capitalist system, right? Wrong, the public works you see are a relic of the Hawaiian people that once ruled. The marina is a former fishpond of massive dimensions, approximately 500 acres in area or the largest on the island! Researchers think that around ten thousand people worked to construct such ponds. To feed a population, we alter nature, the land and hydrology in this case, for our own ends. The manner in which we do this, however, always lies on a spectrum of sustainability. Here, we see the remnants of a system that lasted for hundreds of years and likely served as habitat for many other species, not to say that Hawaiians were perfect stewards. These relatively mutually beneficial relationships between human production systems and the natural world fascinate the curious mind. Where we have to change or manipulate the natural world in some way for our needs, we can do so without quickly eroding the very source upon which meeting those needs requires. After 1,000 steps up a steep hill to its vantage point over the ponds, I have to admit that I felt a sense that finding out about the ponds just then was a broader sign (I was maybe just dizzy). My Fellowship with Conservation International deals with food security and conservation, namely, how community-based natural resource management can ensure long-term access to sufficient and healthy food for the millions upon millions of people throughout the world that depend on fish as their main source of food. In fact, Hawaii’s people used to manage their fisheries through a system of traditional beliefs and taboos that banned or restricted activities in certain areas throughout the year. They also implemented governance systems that allocated rights to certain communities within specified boundaries, leading to more sustainable use of the resource due to a resulting sense of assurance that the resource would be there tomorrow and the next day. Some of these ideas are still in practice, or being restored, but only after a long period of decline ushered in by the race of colonial powers to take over Hawaii for sugar cane production, principally, and its strategic location. Similar scenarios played themselves out across the Pacific and its many island nations with the influx of colonial power such as France, Germany, Great Britain, and the United States, transforming whole societies and their cultures, including, often, their means of managing the natural world around them. Like the fishponds filled and transformed into housing, bars, and an aquatic parking lot, most Pacific peoples and their traditions would never be quite the same. Fortunately, conservation and development initiatives, along with national governments and international sources of aid, have begun to see the strength of those traditional management systems. A vast array of researchers and organizations are striving to learn from those systems and combine them with the power of science and modern technologies to improve outcomes for the conservation of coral reefs, mangroves, lagoons, and other ecosystems and their services, thus ensuring development objectives such as food security and poverty alleviation. My Fellowship will consist of a literature review and case study development to show how effective community-based natural resource management can be at achieving both development and conservation goals, and under what circumstances. The ultimate purpose of this process is to generate knowledge-sharing materials to accelerate the diffusion of community-based management across the Coral Triangle, preventing or reducing poverty and ensuring access to food while preserving the region’s mega bio-diverse marine ecosystems and their associated services. This entry was posted in 2018, Bryce Bray. Bookmark the permalink.